Living Wage employers will pay their staff at least £8.75 per hour across the UK and £10.20 in London, it was announced today. The UK Living Wage rate, which is voluntary unlike the mandatory national living wage rate, has increased 3.6% from £8.45 to £8.75, while the London Living Wage has increased 4.6% from £9.75 to £10.20 an hour. The main rate is now £1.25 per hour more than the national living wage (NLW), the minimum wage rate for employees aged 25 and over. In London, it exceeds the NLW by £2.70 an hour. Living Wage rates are independently calculated, based on the real cost of living in the UK and London. The 2017 increases have been largely driven by higher inflation feeding through to the basket of goods and services that underpin the rates, with rising private rents and transport costs also having an impact. Living Wage Foundation director Katherine Chapman said: “In-work poverty is today’s story. New figures out yesterday show that 5.5 million people are still paid less than the real Living Wage – it’s fantastic that this year alone over a thousand more employers have chosen to go beyond the legal minimum and pay a real Living Wage, putting fairness and respect at the heart of their business. The announcements came after research published by KPMG yesterday showed that 5.5 million people across the UK are still paid less than the real Living Wage – 21% of the UK workforce. It also found that 59% of those earning below the real Living Wage indicated a sharp increase in the cost of living and that 21% of employees earning below the threshold said their job security had worsened, compared with just 8% who noted an improvement. 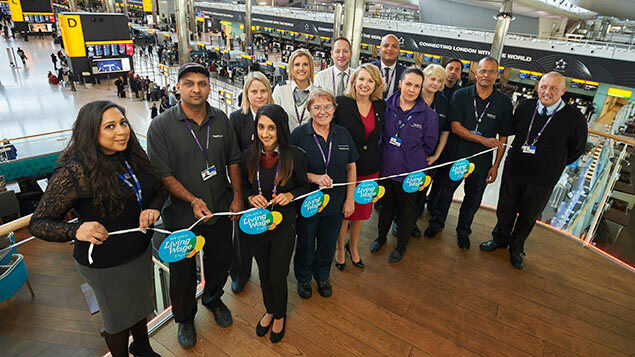 The Living Wage Foundation announced today that Heathrow will become the first Living Wage airport, ensuring that 3,200 workers are paid the Living Wage by the end of 2020. Heathrow joins more than 3,600 employers across the UK, including one third of the FTSE 100 and household names like Ikea, Aviva and Nationwide. More than 1,000 employers have signed up to pay the real Living Wage over the past year, including companies as diverse as Lush, Diageo and Arriva Rail. The Mayor of London Sadiq Khan said: “I am determined to make London a fairer and more equal city, and the news that more than 1,500 businesses are paying the wage is a good step towards achieving that. But we need to go further – and for many more businesses and organisations to sign up. Living Wage rates are being launched at events across the UK during Living Wage Week, which started yesterday: in Edinburgh by first minister Nicola Sturgeon, in Cardiff by first minister Carwyn Jones, and by mayors of Greater Manchester, Liverpool City Region, and Cambridgeshire & Peterborough.